Are You New to Phone Words? You may have stumbled upon or even heard a radio commercial talking about phone words for sale. As business owner this concept might be totally new to you. But, you are willing to find out how having phone words can make a huge difference to your turnover. The important thing to remember is that you would be dealing with potential customers who would have a distinct interest in getting their problems solved. Your company has the ability to create the solution through providing them with phone words that spells out the answer to their problem. By seeing or hearing about your company through viewing an advert or listening to a broadcast, your potential customers should be able to formulate a pretty good idea in their minds as to the type of products or services your business provides. Phone words normally do well on bill boards or by means of the spoken word through one or the other radio commercial. This is where small business owners have the opportunity to reach out to prospects using phone words and create the right impression at the right time when the customer has a specific problem that they need a solution for in a hurry. Just imagine that the respective customer needs to have a garden trellis erected for an upcoming wedding celebration, and you happen to specialise in garden furniture and accessories. Essentially, you could be targeting the word ‘Treillises’ or ‘Garden Trellis’ and have it advertised as either 1300 GARDEN TRELLIS or 1800 GARDEN TRELLIS. That would be extremely powerful as you can be sure that the customer would be phoning you first due to the ease of remembering your particular phone word. If your potential customers happen to have a smart phone with a Qwerty keypad, they could easily dial your smart number as they only have to hold down the alt key, then type in your phone word to have it displayed on their phone screen. From here it is as simple as pressing the dial button to get through to your business. 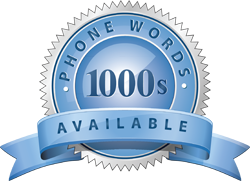 It is simply amazing how easy it can be to reach hundreds of potential prospects through using the right phone words for your business. As you are new to all of this, you might not know which phonewords/smartnumbers would be the right ones to use. Luckily there is a company known as1300EasyDial that will be able to give your personal advice while being able to assist you with a wide range of phone words for sale. All you have to do is dial 1300EasyDial to make it happen.